For many eBay sellers, a home eBay business is their first experience with any home business at all. They may not realize all the nuances and legalities involved in a home business such as tax implications or liability issues for selling recalled or defective products. One area that newer sellers often misunderstand is the use of USPS mail supplies when shipping. There are several misconceptions about the free USPS mail supplies, and all sellers should do their due diligence to understand how these free supplies are used. 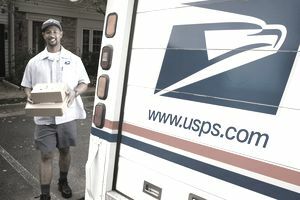 Misuse of USPS supplies can result in fines from the U.S. government, as well as unhappy eBay customers and bad feedback. USPS Priority Mail supplies are free from the post office. These supplies are marked with the USPS logo and "Priority Mail" wording, and may only be used for the paid Priority Mail shipping service. Continued misuse may lead to the post office charging everyone for these supplies in the future. "This packaging is the property of the United States Postal Service and is provided solely for use in sending Priority Mail shipments. Misuse may be a violation of federal law. This packaging is not for resale." Oh clever eBay sellers, you aren't as clever as you think. This has been going on for years, where eBay sellers think they can outsmart the post office by turning the free Priority Mail supplies inside out so that the Priority Mail branding and USPS logo won't show. The post office began stamping the inside of its free boxes and Tyvek envelopes with the Priority Mail branding so that if the box is turned inside out it is still very obvious what's been done. Countless sellers still tell others to use this strategy for shipping items first class, parcel select, or first class international without having to pay for their own packaging. Get the right supplies you need to start with. If money is tight, there are several ways to get free shipping supplies around your own community. You should also be checking the profitability of your items for sale, and making sure that you're selling goods that have enough profit to cover the costs of shipping supplies as well as earing you a fair profit. Another common misuse of USPS supplies is using the envelopes for packing material. For example, a seller may wrap a small, breakable, lightweight item in a flat-rate Priority Mail-branded padded envelope then put that inside a plain, low-cost polypropylene bag mailer and ship the item using the first-class mail service. Using Priority Mail flat-rate envelopes or Priority Mail Tyvek envelopes as dunnage or packing material for larger items in boxes is prohibited by the USPS. Ordering in bulk, or taking supplies from the post office with the intention of using them as packing material is also not allowed. This kind of unethical behavior is costly for the USPS and will contribute to them having to charge for Priority Mail supplies at some point in the future. "Frankensteining" boxes is a common practice and is allowed when using any non-flat rate box. For example, say that you're shipping a lamp, and the lamp is too large to fit in any of the Priority Mail boxes. If you're shipping the lamp using the Priority Mail level of service, you can take several 8x8x12 Priority Mail boxes and "telescope" them, or fashion them together to make a long tubular box. This process is completely USPS legal. Just not with flat rate boxes. Why? Because Priority Mail shipping charges are calculated using weight, and flat-rate prices have already been calculated for each specific-sized flat-rate box. The same situation applies to the padded and cardboard flat-rate mailers. The item must fit inside completely and the mailer must close on its own without extra tape. This is another big no-no. In fact, covering a box in paper is not a good idea for any shipping service because the paper can get caught in the processing machines during transit and ripped off. The package will end up in the undeliverable package graveyard and can't be returned to the seller or delivered to the buyer because there is no longer information on the package. As for Priority Mail supplies, covering them in paper is a blatant attempt to circumvent paying the fees for Priority Mail. Just don't do it. The USPS can assess a fine for customers who misuse Priority Mail supplies, and this is clearly stated in the disclaimer on the supplies. So, maybe you won't get caught when your improperly packaged item is dropped in the mail or picked up by the mail carrier, but the buyer might pay the price. When Priority Mail supplies are misused, the item can be delivered to the customer with postage due. The buyer will receive a notice to pick up the package at their post office, and they will be charged a fee for the postage that was upgraded to the Priority Mail service due to the supplies used. By taking this shortcut to try and save a few pennies, sellers are inconveniencing buyers with a trip to the post office and requiring the buyer to pay extra to get his item. This is a very effective way to get negative feedback from customers and low marks on your eBay account. Get the supplies you need ahead of time when selling on eBay. Figure out what types of boxes and packing materials are needed when listing the item, and make arrangements to buy them. Being prepared is an important part of being a successful entrepreneur.